March 29, 2019 This post may contain affiliate links. There is something seriously comforting about a smooth, creamy, steaming hot bowl of chicken soup on a rainy afternoon. 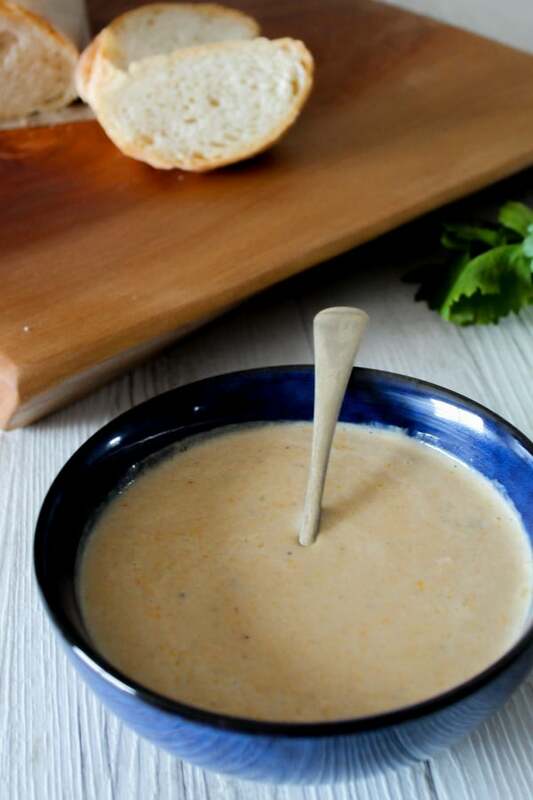 This delicious family favorite cream of chicken soup recipe is what childhood memories are made of. I dread the birthday party seasons. And I figure (and this is from years of kids party experiences) that they come in two batches every year -peaking at around March and September. Which also happens to be the time when the dreaded cold or flu virus hits our home. Coincidence? I think not. Germs love attending kids birthday parties. I do my best to stop the spread of germs is the house by quarantining the infected child to their room for as long as possible (aka unlimited screen time),….but chances are at least 4 out of 6 of us will get it. With most viruses, you just need to let them them run their course, but there are a few things that you can do to help speed recovery. Boost Immunity: Keeping kids healthy during cold Season definitely helps them to recover faster. Healthy food, fresh air and exercise is a great place to start. 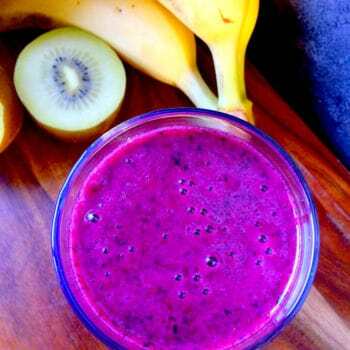 An extra dose Vitamin C won’t go amiss either, or try this really delicious Immunity Smoothie. Mommy TLC: We have a ‘Cold Recovery Routine’ in our home. It involves hot water bottles, mugs of hot chocolate, soft blankets and a smooth Cream of Chicken soup. Keeping you Warm: Pretty obvious, but nothing warms you like a hot cuppa soup on a cold day. Nutrient dense: Kids appetites are not the best when they feel under the weather, so adding fresh veggies to your soup is a great way to get some nutrients into their bodies without too much of a fuss. The nutrition-filled chicken broth helps boost immunity with essential vitamins and minerals. Easy to digest: The smooth soup is easy to digest and swallow, which helps if your little one has a sore throat or poor appetite. 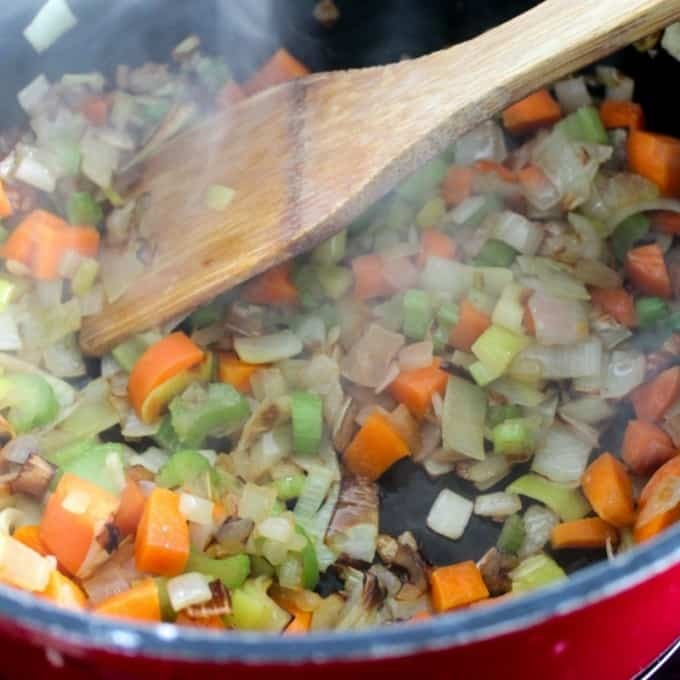 Most soups are easy to freeze and reheat. Cream of Chicken soup is no exception. Make a large pot over the weekend, spoon into airtight containers and freeze. Will keep well for up to two months. I prefer to use glass or plastic containers that you can see through, only because it makes finding them in my freezer a whole lot easier. You can reheat each portion of soup when you need it. My grandmother would make a giant stockpot full of this soup during Winter and store family sized portions in those large ziplock bags and freeze flat packed in her freezer. ** Family Favorite** Nothing beats a smooth, creamy, steaming hot bowl of chicken soup on a rainy afternoon. Nothing. This yummy bowl of homemade chicken soup goodness is what childhood memories are made of. Stir in flour, salt and pepper. Slowly stir in chicken stock and milk. Keep stirring as soup thickens to prevent lumps forming. Simmer over medium heat until soup thickens. 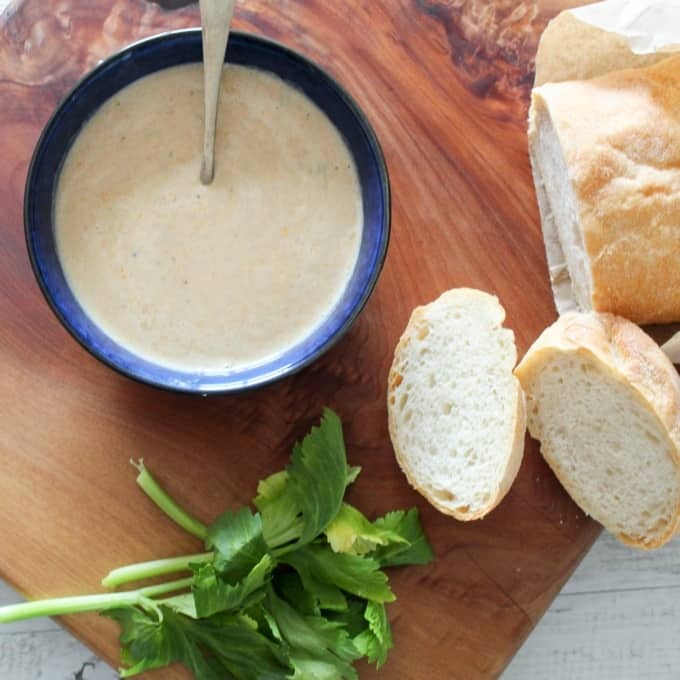 For a smoother soup, use a stick blender to blend or transfer to a blender and blend until smooth. Serve with fresh sour dough bread or crunchy croutons. 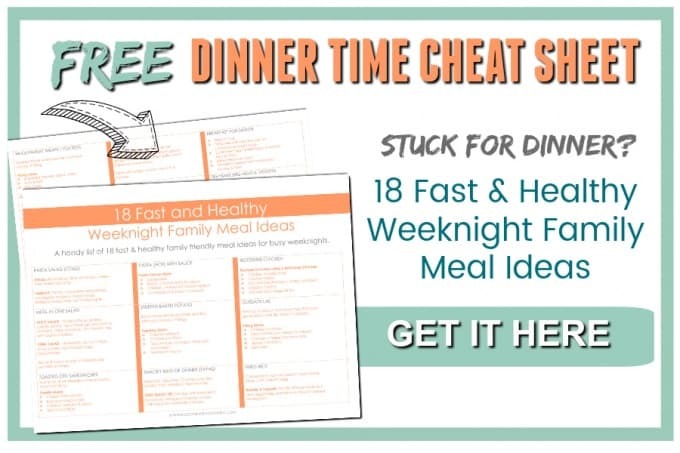 Get my Printable Dinner Time Cheat Sheet with 18 fast (20 minute or less) & healthy weeknight meal ideas that the whole family will enjoy. Click here to get it now and start using it tonight.